Kawa Paltsek (Tib. སྐ་བ་དཔལ་བརྩེགས་, Wyl. 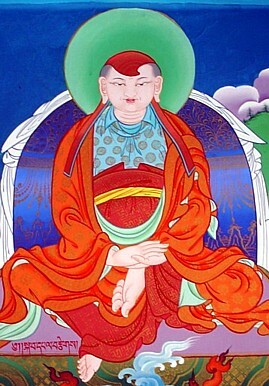 ska ba dpal brtsegs) — one of the twenty-five disciples of Guru Rinpoche. He was born in Kawa in Phenpo Valley. He was ordained by the great abbot Shantarakshita and became one of the greatest Tibetan translators. With panditas such as Jñanagarbha and Vidyakarasimha, he translated the prajnaparamita and other mahayana sutras and Haribhadra’s major commentary on the Abhisamayalankara known as Sphutartha. He collaborated with Vidyakaraprabha in translating treatises on Madhyamika and logic; and with Jinamitra, he translated Vasubandhu’s Abhidharmakosha and commentary. Together with Sarvajñadeva, he was the first to translate the Bodhicharyavatara into Tibetan. He also translated many tantras later collected in the Nyingma Gyübum. Along with Chokro Lüi Gyaltsen, he was sent to India by king Trisong Detsen to invite Vimalamitra to Tibet. He later received the Vima Nyingtik teachings from Vimalamitra in Samyé. This page was last edited on 15 February 2019, at 04:50.